GARDEN TRACTOR RUNS AND WORKS GREAT,HAS AG. GRIP REAR TIRES THAT ARE LOADED,WHOLE WORKS GOES AS A PACKAGE. 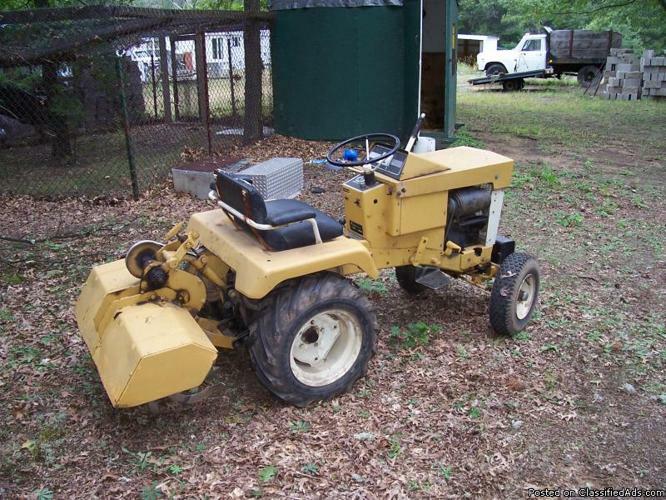 INCLUDES:B-110 TRACTOR, TILLER,PLOW,DOZER BLADE, REAR BLADE,12 VOLT ELECTRIC SEEDER/FERTILIZER,SPRING TOOTH DRAG,TRAILER,EXTRA SET OF REAR TURF TIRES ON RIMS, TRACTOR HAS 3-POINT MANUAL LIFT, AND ALSO HAS A FRONT PTO PULLEY FOR AN AUXILLARY POWER SOURCE,IT ALL COULD USE A GOOD PAINT JOB.I HAVE OWNED AND USED FOR SEVERAL YEARS. WOULD BE GREAT FOR COUNTRY HOME,FARMETTE OR LARGE GARDENS. IT WILL HURT TO SELL THIS ALL BUT MONEY IS SHORT.